DETROIT, Mich. — Marygrove Athletics is proud to announce a partnership with Stretch Internet to provide free live audio streaming at home events for men’s and women’s basketball, men’s and women’s soccer, and women’s volleyball for the 2013-14 athletics season. Beginning Fall 2013, home athletic contests will be streamed via Stretch Internet in a customized, user-friendly Game Central portal designed for Marygrove Athletics. To visit the Marygrove Athletics portal, click here. The branded gameday portal, also featuring an integrated live stats feed for the approximately 50 covered events this year, enhances Marygrove’s gameday presence by housing free live audio play-by-play and live stats all in one easy-to-use platform. Live audio and live stats via Stretch Internet can also be streamed through a variety of portable devices. Currently, Stretch supports all iOS (iPhone, iPad and iPod Touch) and Android devices so fans can access live gameday content, or archived contests, whenever and wherever they can connect. Currently, all fall sports home contests are listed in the new gameday portal. Times listed reflect the broadcast airtime — approximately 10 minutes prior to each event. Winter sports and selected other contests will be added as schedules become finalized. The inaugural live audio and live stats broadcast will take place Saturday, August 24 when the men’s soccer team hosts Taylor University (Ind.). Game time is 3:00 p.m. with a broadcast air time of 2:50 p.m. 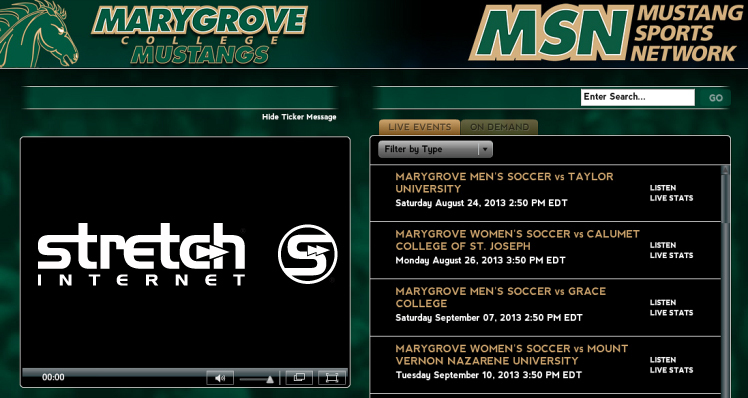 The new branded gameday portal also marks the expansion of the Mustang Sports Network â the audio/video production arm of Marygrove sports information. Beginning this year, the rebranded Mustang Sports Network will soon feature the aforementioned live audio and live stats streams, as well as a comprehensive video library that will comprise of coach and student-athlete interviews, postgame reports, and weekly recaps/updates covering all athletic news. Stretch Internet, based in Mesa, Ariz., was founded in 2003 by a former college athletics media relations professional who saw a need to provide affordable, high-quality streaming to college and university athletic departments. StretchÂ Internet now works with nearly 300 colleges and universities, high schools and professional sports organizations. A devotion to utilizing the best streaming technology possible and providing a first-class presentation â backed by the best customer support in the business â have helped Stretch Internet become one of the largest streaming media specialists in the sports industry.